The last volume of poems connected with what Paul Celan described as “die Wende” (“the turn”) Lightduress was written between June and December in 1967, and appeared approximately three months after the poet’s suicide in 1970. 1967, the year in which he composed most of this book, had been a difficult year for Celan, beginning with Claire Goll, the widow of poet Yvan Goll, wrongly accusing him of plagiarizing her husband’s poetry. Five days later, Celan attempted suicide with a knife aimed at his heart. From mid-February until mid-October he was interned at the Saint-Anne psychiatric hospital, and only in late April was allowed to travel. In the same month he and Gisèle Celan-Lestrange, after difficult discussions, concluded that a separation was necessary, and Celan started to look for an apartment in Paris. 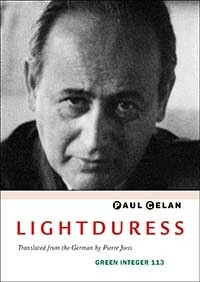 During this same period, on the other hand, Celan wrote more than half of the poems of Threadsuns and a major part of this volume, and in July he traveled to Germany, leacturing at the University of Freiburg-im-Brisgau to a large audience that included the philosopher Martin Heidegger. By October, Breathturn began to receive its first positive reviews and Celan moved in to a small apartment in the 5th arrondissement. This long-awaited translation by the noted poet and translator Pierre Joris, represents, along with Breathturn and Threadsuns (both also available from Green Integer) the mature expression of one of the most important poets of the 20th century. Paul Celan was a poet of many layers, and until recently readers for English could only imagine his power and complexity. Recent translations of Celan by Pierre Joris, John Felstiner and others, however, have revealed this master's poetic achievement to the english language reading audience. In this book, English language readers can now know the Romanian works of Celan. Poet and critic Andrei Codrescu wrote of this volume:"Paul Celan...has become the wa material of so much critical processing, it has become difficult to read him without hearing the voices of the commentators. The continual buzzing go the interpretive chorus around Celan's poetry has nearly added another layer of pain to work that is already written at the synapses of raw nerves. I say "nearly" because happily there is Julian Semilian and Sanda Agalidi, who ttranslatethe poetry as if there are only two entities in the room: Psyche and Echo. Celan would have been proud to be thus refreshed."